The first smoothies I ever made as a kid were loaded with frozen fruits of all kinds. This included all kinds of berries, but also usually a full banana or mango for sweetness. In addition I would add milk to make it creamy, some maple syrup because at the time I thought it needed it, and a scoop of some generic protein powder just because that’s what you add to smoothies, right? Then I would gulp it down (trying not to get a brain freeze) as I rushed out the door to start my school day. Since then, I’ve explored the many avenues of creating smoothies, and have found they don’t have to be made with only fruit and eaten in a rush out the door. 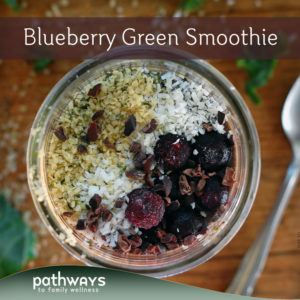 In fact, the best smoothies are packed with vegetables with only a little bit of fruit (mainly berries), and lots of good fats and spice to keep you full and satiated. And once artistically topped with all your favorite things, they can be slowly eaten with gratitude and preferably a spoon. I just love the idea of putting all these beautiful colored vegetables and fruits together to create a tasty and satisfying drink. Knowing I am getting a full dose of vitamins and minerals to start my day is quite satisfying. I like to top my smoothies with all the nuts, seeds and “superfoods” I desire because that is honestly the most fun; decoration. The more the merrier here, because why not? To me, presentation is just as important as the contents of a good meal. If you love the way your food looks, and have put honest and true love into creating it, you will be able to cherish the outcome and absorb the nutrients that much more. This recipe may be quick and easy to make, but be sure you take your time serving it just as you like. Bring yourself into the present moment and appreciate the ingredients you have just so harmoniously put together. Allow yourself to relax into a comfortable seat and take a couple deep breaths. Practice gratitude, mindfulness, and be at peace with yourself and that moment. Then, and only then, shall we take our spoon and indulge in the first bite. *1/2 cup will make it a thicker, smoothie-bowl-like consistency. 1 cup will make it a drinkable smoothie. Massage your kale if needed. 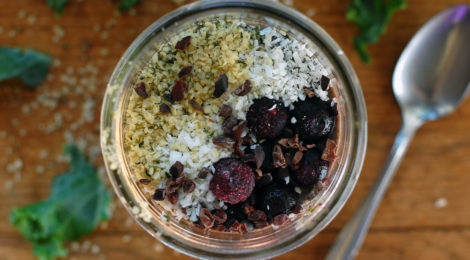 Add all ingredients into a blender or food processor and blend until desired consistency is reached. Top with nuts, seeds or fruit if desired and enjoy!